Gently fry the garlic, add the squid, cut into rings, and toss quickly. Add the stock, extra virgin olive oil, salt and pepper. Cook the linguine in salted water and finish cooking in the pan. When cooked, add the squid, parsley and tomatoes. Using a colander and some tongs, make a nest and position it in the middle of the plate. 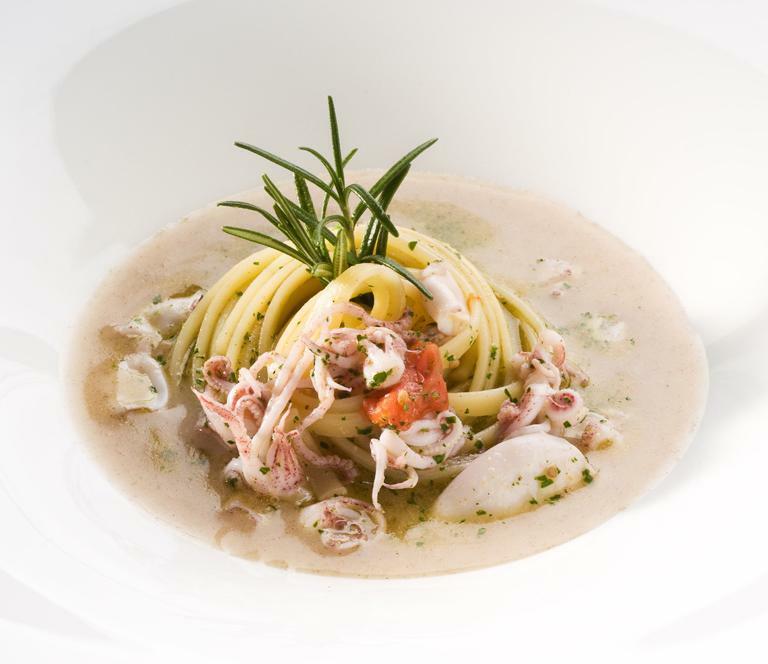 Add the bread sauce around the linguine and position the squid on top. Cut the bread into cubes and toast it in the oven. Cut the scallion into julienne strips and gently fry with oil and thyme. Add the bread, the white wine and the chicken stock. When cooked, blend everything and filter through a fine strainer.